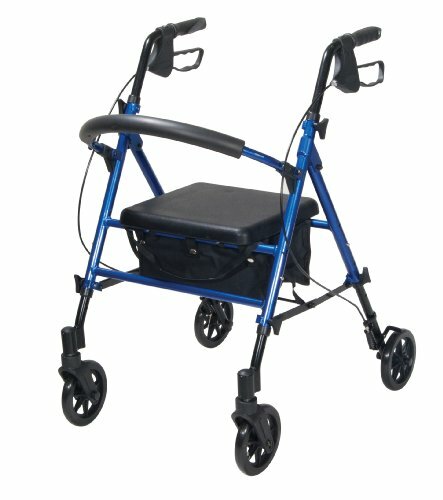 If youre seeking a safe, convenient aid to improving your daily mobility, a Rollator can be the ideal solution. Wheels make a Rollator a superior option over a standard walker, eliminating the need to lift the device and allowing you to walk with an easy, smooth gait. Plus, Rollators are better for traveling over uneven, outdoor terrain, making them great for your active, busy lifestyle. And with the built-in seat found on a Rollator, youll always have a convenient place to rest. Drives Rollator with 6 Casters is the perfect unit to suit your needs and your style. Its designed and built for maximum comfort, durability and ease of use with quick folding ability and simple handle height and angle adjustment. It has a unique seamless padded seat for maximum sitting comfort and ease of care. The backrest is also padded and large soft grip wheels ensure smooth travel over a variety of different terrains. It even has a convenient, zippered pouch for privately and securely carrying items with you on the go.